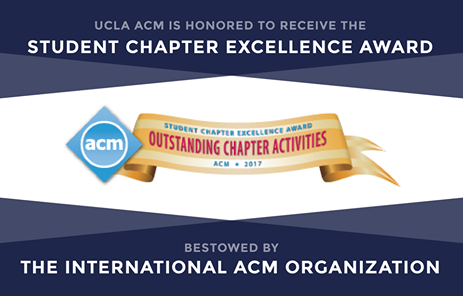 This year, out of over 680 student chapters worldwide, UCLA ACM has been awarded with the 2016-2017 ACM Student Chapter Excellence Award for Outstanding Activities. The UCLA Association for Computing Machinery is a branch of ACM, an international organization which aims to “bring together computing educators, researchers, and professionals to inspire dialogue, share resources, and address the field’s challenges”. With hundreds of members, UCLA ACM is the biggest computer science club on campus, and one of the largest student-run tech communities in Los Angeles. It’s hard to believe that just 3 years ago, ACM was nonexistent on the UCLA campus. While the club had been active in the years past, it was under hiatus for years until UCLA alumni Akshay Bakshi and Shahid Chohan decided to restart the club in 2014. Since then, ACM has fostered enormous growth, not only within the club, but within the computer science community in general. Recently, ACM has been focusing on improving opportunities in entrepreneurship, education, and research, and hopes to expand student interests in all fields of technology. Because of the vastness of both ACM and the field of computer science, ACM contains 5 committees which members can join based on their interests: Hack, International Collegiate Programming Contest (ICPC), ACM-W, AI, and Virtual Reality and Computer Graphics (VRCG). ACM Hack, led by president Dmitri Brereton, was founded in 2015 and aims to “unlock the potential of UCLA’s hacking community through education and collaboration”. Its main goal is to educate students of all skill levels in programming, and empower them to influence the world through code. One of its largest projects is Hack Camp, a quarter-long bootcamp which aims to help students of all majors build the programming skills needed to create their own projects. Hack Camp has taught web development and Android in past quarters, and this quarter, its primary focus is on iOS development. In addition to Hack Camp, ACM Hack also hosts Hack on the Hill, a 12-hour beginner-friendly hackathon, as well as Hacker Expo, a demo day for student projects. Despite having been in existence for only 2 years, ACM Hack regularly draws a large crowd for its events, with the first session of Hack Camp attracting over a hundred students. ACM-W, led by president Sharon Grewal, is a branch of ACM that “supports, celebrates, and advocates for the full engagement of all who are interested in computer science”. One of the largest events ACM-W hosts is the Women in Engineering Stayover Program, where ACM-W members host admitted female engineering students overnight, and invite them to a day of mentorship. “We want to show them that if they come to UCLA, they’ll definitely have a community that supports them,” Johnson added. Last year, approximately 76% of admitted female engineering students committed to UCLA, an impressive figure considering the overall yield for UCs across all majors generally ranges from 20-40%. ACM-ICPC strives to “promote critical thinking and problem solving through practice and participation in programming competitions”. ACM-ICPC regularly holds training sessions to hone members’ competitive programming skills, as well as practice coding competitions. More recently, it started Project A*, a quarter-long, beginner-friendly academy which teaches students about interesting algorithms and their implementations. Every year, ACM-ICPC also forms a team to participate in the ACM International Collegiate Programming Contest, and this year, the UCLA ACM-ICPC team was one of 133 teams to qualify for the world finals. ACM-AI holds weekly beginner-friendly machine learning workshops, where they explore different aspects of AI and machine learning. This quarter, ACM-AI is holding a multi-part workshop series on machine learning using Google’s TensorFlow, an open-source software library for machine intelligence. ACM-VCRG was formed in hopes of “providing a community in which developers interested in virtual reality and computer graphics can connect, learn, and create”. Its weekly workshops feature opportunities where students can learn to create virtual reality games, and this quarter, ACM-VCRG centered its workshops around creating a Google Cardboard experience in the cross-platform game engine Unity, allowing students the opportunity to develop VR games in an affordable way. More recently, ACM has started yet another project – UCLA DevX: Moonshots for UCLA – which aims to provide students the opportunity to grow their technical skills by building practical applications that tackle pressing problems of the UCLA community. Already, DevX has produced a number of projects, including Bruin Scan, an app which aims to make class planning easier, and Bruin Meet, an app which focuses on simplifying the experience of finding study partners, social groups, or a friend to eat with. ACM also partnered with UCLA UPE to host Founder’s School, Southern California’s largest university entrepreneurship conference, for its second year. This year, in accordance to the conference’s theme of exploration, workshops and speakers focused on giving students the opportunity to explore different aspects of entrepreneurship as well as career planning. Among the many speakers were Eugene Marinelli, co-founder and CTO of Blend, Angelia Trinidad, Founder and CEO of Passion Planner, as well as Jacob Jaber, CEO of Philz Coffee. The event drew students hailing from a number of Southern California schools, including CalTech, UCSD, and USC. Overall, UCLA ACM is an incredible resource for not only the computer science community at UCLA, but for the student population of UCLA in general. It provides countless opportunities for students of all majors to become a part of the computer science community, build their practical skills with peers, and learn and apply topics outside of their regular courses. ACM has also made extensive efforts to act as a liaison between students and faculty to ensure students’ voices are being heard, and has recently paired with other student groups to develop a survey on students’ thoughts on CS curriculum, which can be accessed here. To learn more about ACM and its efforts in diversifying opportunities for the computer science community at UCLA, follow its Facebook page, website, and blog.